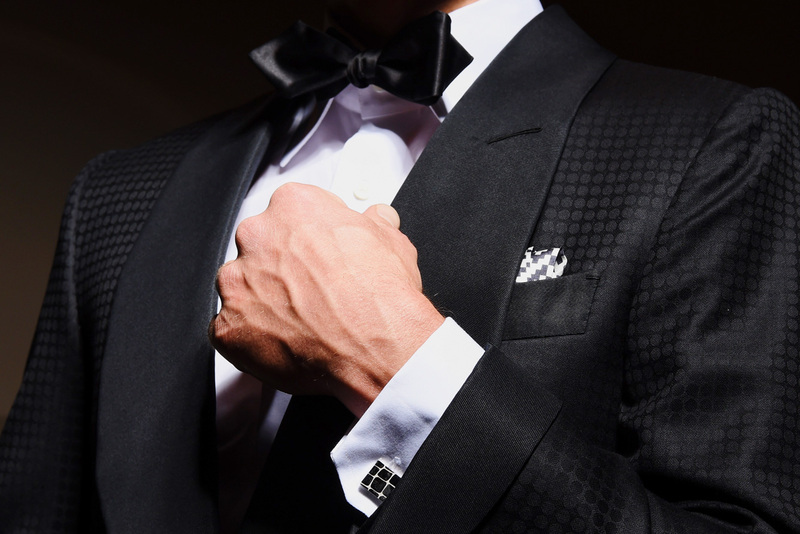 A true gentleman knows that details matter, and this is exceptionally true when putting together styling options for the shirt and accessories that complete your black-tie ensemble. From shirt collar styles to tuxedo studs to formal shoes, these considerations can make or break your outfit. A tuxedo shirt is markedly different than your standard dress shirt. It’s important to know the differences. 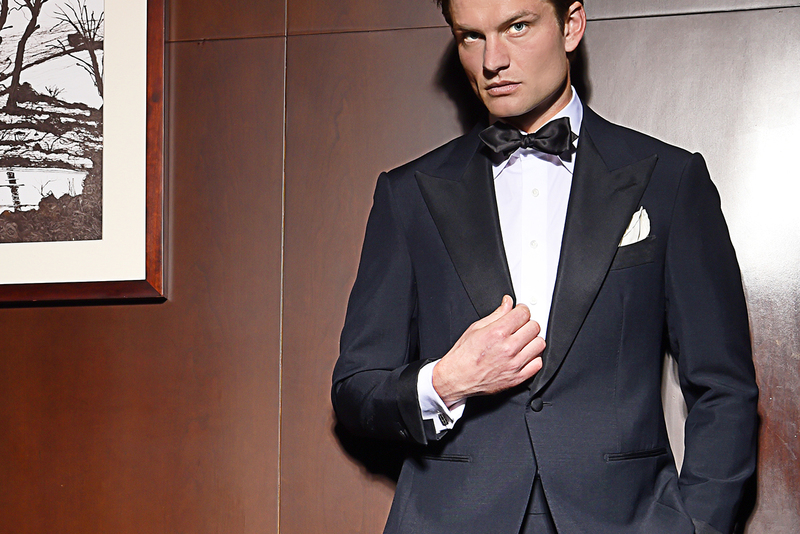 In terms of collars, both a formal wing-style and a classic turn-down collar are acceptable for black-tie. 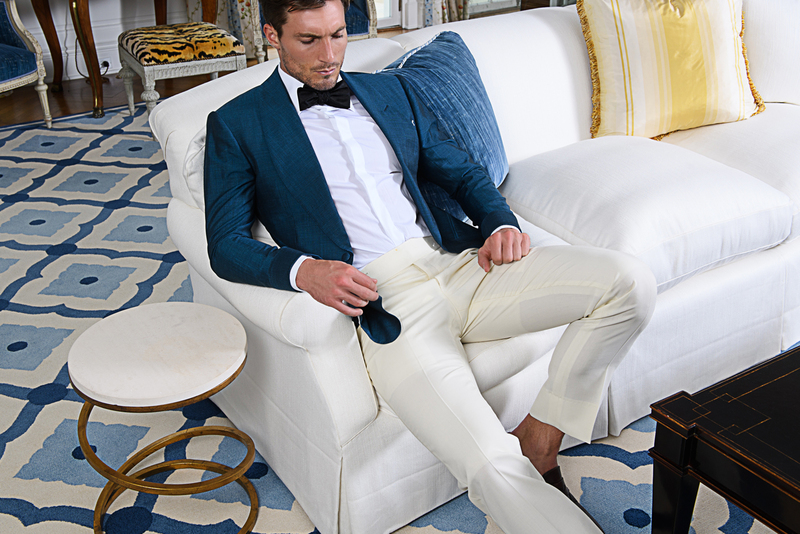 A wing collar is generally considered more formal and is the only appropriate option for white-tie. 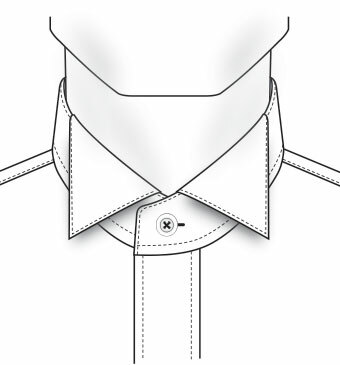 If you opt for a turn-down collar, stick with a narrow spread and no tie-space. The first rule of formalwear when it comes to shirts is that buttons should never be seen. In light of this rule, you’ll find there are two main options for the front closure of the shirt. Traditional tuxedo shirts replace the top four (or five) buttons on the shirt front with buttonholes on both sides of the shirt. The shirt is secured using decorative studs instead of buttons, similar to the way cufflinks work on French cuffs. As an alternative to wearing tuxedo studs, you can wear a shirt with a covered placket for a subtle and understated move. This style involves a tailored strip of fabric that covers the shirt’s buttons and buttonholes completely. Though understated, it’s a more contemporary look than tuxedo studs. 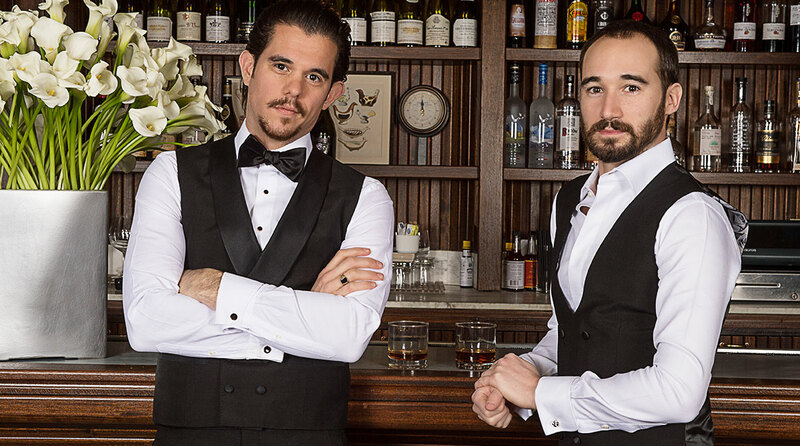 In addition to the two front closure options, a tuxedo shirt can have three front styles: plain, pique bib and pleated bib front. A plain front is a minimalist look featuring no ornamentation at all and is commonly paired with the hidden front closure. Occupying the less formal end of the black-tie spectrum, the shirt can be made from a crisp thin poplin or a textured material like a diamond weave if you want to add a bit of flare. A pique bib features an extra layer of heavy, textured fabric attached to the part of the shirt that is seen when your jacket is on (as it should be). 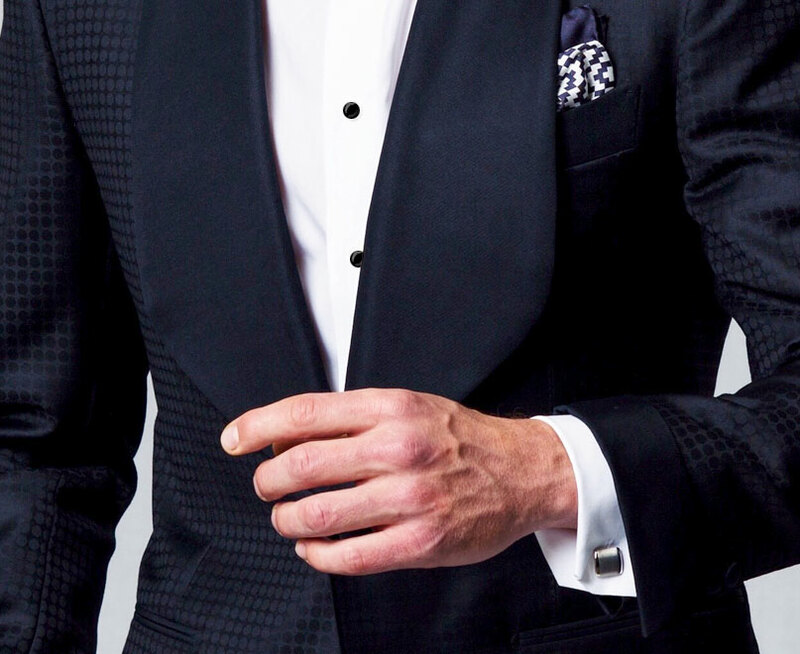 The bib typically ends just below the fifth tuxedo stud so that the bottom of the bib would be covered by one’s cummerbund. The body of the shirt is always made from a thin poplin and the bib itself can be made from any contrasting textured white fabric. 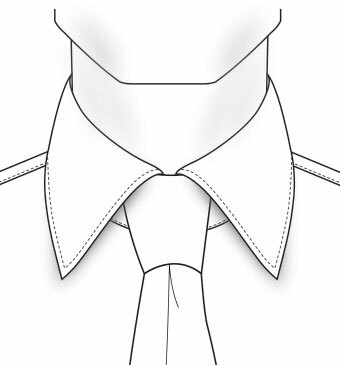 A pleated bib is similar to the pique bib in that an extra layer of fabric is attached to the front of a poplin shirt. However, instead of using a textured fabric that is sewn on flat, the pleats are made from the same poplin fabric as the shirt body. The pleats can be of widths ranging from ¼” up to 1” depending on one’s preference. Both bib fronts are best paired with a tuxedo stud placket. 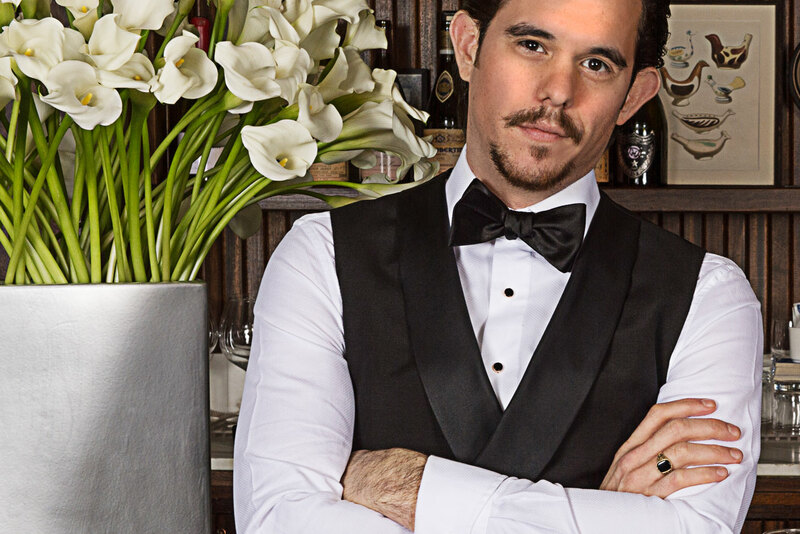 If you are attending an event that calls for a tuxedo, a bowtie is most often the neckwear of choice. Your bowtie should generally be black or midnight blue, and, ideally, match the material used on your tuxedo jacket’s lapel facing. In terms of style, you have several options, each distinguished by varying size and shapes. A butterfly bowtie, for example, is a classic option and arguably the most popular choice for formalwear. Marked by a narrow centre and wide, flattened ends (you know what a butterfly looks like), it’s a fail-safe choice that also has the benefit of slimming the face. A semi-butterfly is a less dramatic look, much the same shape as the butterfly but slimmer and often with double corners. This is more contemporary option but still classic and sophisticated. A straight-end bowtie is sometimes called a batwing, and is slim and minimal. A pointed-end or diamond-tip is the only style without flat ends. It’s a somewhat bold choice, but not overly so. Perfect if you know you can rock the butterfly and are looking for a little something to take your bowtie game to the next level. People sometimes opt for long ties as well, but if you’re going this route it should be paired with a waistcoat and never with a cummerbund. For a formal event, we suggest a dark, solid color without a pattern, although one can opt for a richly-textured material like grenadine to add a unique touch. If your tuxedo shirt has stud holes, then obviously studs are required. Studs and cufflinks are classy and elegant tuxedo accessories and traditionally feature onyx or mother of pearl faces ringed with silver or gold rims, although more ornate and fanciful options are available as well. Regardless of your selection, your studs should complement your cuff links. A tuxedo shirt should always has French cuffs. Period. Traditionally, the shoe style of choice for formalwear is a patent leather or velvet pump, with either a pinched or flat bow on the front. Historically these were paired with tuxedos because they suggested a certain luxurious comfort, almost like a slipper, and most certainly something only a gentleman who needn’t step foot outdoors would boast. If you’re looking for contemporary option that’s still black-tie-appropriate, an Oxford is also an excellent choice, whether patent leather or not. Either a plain toe or a cap-toe will work, provided they are solid black, highly polished and absent any decorative “brogue-ing”. 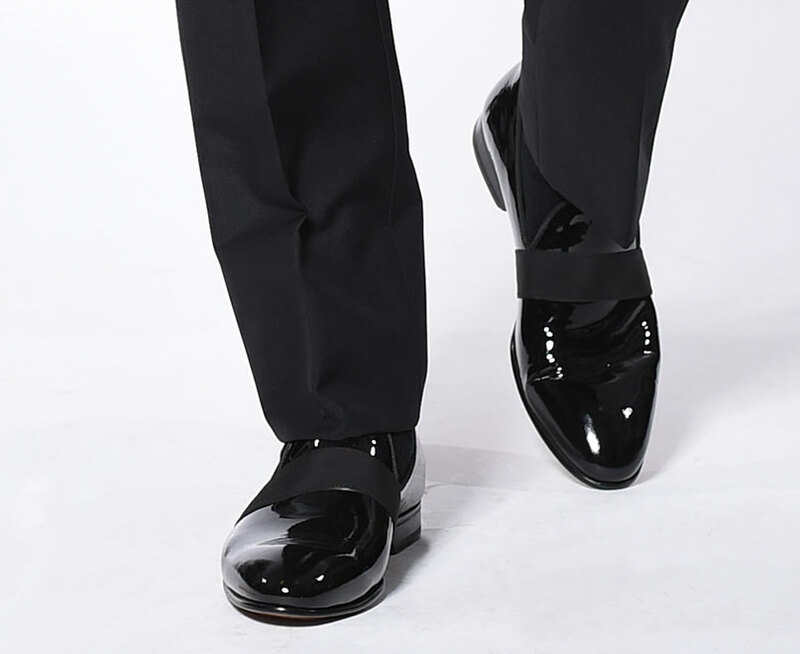 Pair your shoes with thin black silk or nylon socks and you’re good to go.